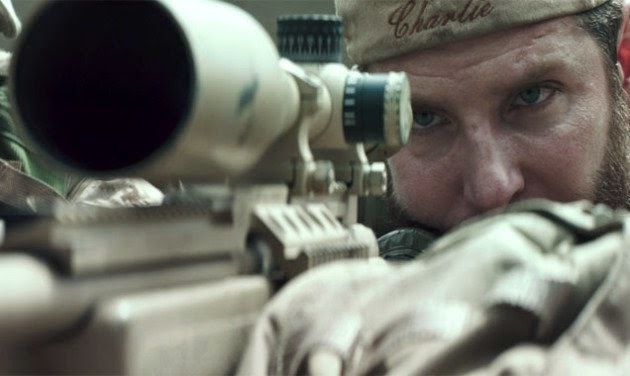 I am struggling to understand the small but vocal backlash against Clint Eastwood’s movie, American Sniper. This movie, like many before it, is based on the real life story of Chris Kyle. He was a Navy Seal credited with the most sniper kills in US history. I have no problem with people disliking the film, or disagreeing with Eastwood’s vision but what bothers me is the unfair politicisation, seeming hypocrisy and the often one-sided arguments of many of these critics. One critical review I read was written by Peter Maass at The Intercept (“HowClint Eastwood Ignores History in ‘American Sniper’). In this piece he chastises his fellow reviewers from the Los Angeles and New York Times as people “who spend too much time in screening rooms” because in Mr. Maass’s estimation they “are falling over themselves in praise of it.” To begin with I find his criticism rather disingenuous. He is part of the same media establishment that completely abdicated its responsibility in the lead up to the US invasion of Iraq. The American media failed to challenge the veracity of every hasty, unproven claim and the numerous unverified assertions of the Bush administration for months before the invasion. I believe it amounted to the greatest failing of media in modern times. So it seems ironic when Mr. Maass says “We got Iraq wrong in the real world. It would be nice to get it right at the multiplex,” considering he was part of the establishment that failed to question Cheney and Bush before they invaded a sovereign nation; without provocation, justification or any real or imminent threat to America. It seems convenient for Mr. Mass to again abdicate his responsibility; this time by chastising a Hollywood movie. It would seem that he wants to cleanse his conscience of all the innocent Iraqi blood on American media hands. If Mr. Maass were serious about righting the wrongs of America’s invasion, he would stop picking on soldiers who served their country and Hollywood, and work on persuading the International Court to summon Messrs. Cheney, Rumsfeld, Wolfowitz, Blair and every other architect of this illegal invasion before a war crimes tribunal. Before I tackle some of the other criticisms that I have read in other media reviews and people’s Facebook posts, I want to clarify that it is a Hollywood film. It never claims to be a documentary, or a historically and factually accurate account of the Iraq war. Furthermore, the filmmakers have gone out of their way to say that they were not trying to make a war movie, much less present a critique of the mess America made in Iraq. Besides, the last time I checked movies are still made to entertain (and make money) by suspending reality with larger than life characters, salacious storylines and over-the-top dramatisations of actual events; even when they are based on biographies. If you want accuracy, analysis and facts, watch a PBS documentary. Additionally, I think we can agree that no matter how brilliant a movie, nothing from Hollywood must be upheld for its historical accuracy or a realistic and honest portrayal of real-life events. That would just make for boring film. This is entertainment pure and simple; I doubt people would pay money to watch the very monotony they came to escape. So, for people to suddenly hold this movie to such a high standard would be the equivalent of saying that they get their world news from Jon Stewart and Steven Colbert. Then decide to take these men to task for factual inaccuracies, lack of objectivity, presenting one-sided views and for dramatising and making light of serious events. Ava DuVerney, the director of Selma, after being criticized for historical inaccuracies in her film, pointed out that we will become a very sad and dangerous society if we expect our kids to learn history through our movies. Another major criticism that people have is that Kyle, as he states in his autobiography, seems to have relished killing and referred to Iraqis as savages. It is likely he enjoyed killing, but Kyle is hardly alone in this. It is said that we must be passionate about what we do to truly excel. So why does it not hold true for soldiers, who are trained killers? I am not saying that every soldier enjoys pulling the trigger and taking a human life, but how can we discount that a small percentage of the men we train to be cold blooded killers will get addicted to and enjoy killing? To this point, I think Kyle’s character in the movie forces us to accept that war is not pretty. It is not politically correct, it is not fair and it is always senseless. The actions taken by soldiers on the battlefield will never fit into neat our little moral codes or Geneva Conventions that make us feel warm and fuzzy in the safety of our homes. War forces good and honourable men to sometimes do both evil and dishonorable things. Soldiers see what human beings were never meant to witness, and war changes everyone. Even those who make it back lose a large part of their humanity. I don’t believe our souls can ever un-see what our eyes have seen. That is the real cost of war, beyond physical injuries. Just like Taya Kyle tells her husband Chris, there are thousands of veterans who came back physically but are yet to make it back emotionally and mentally to their families. This movie does a good job of reminding us of this very real and hidden cost to our soldiers and their families. Have you ever wondered why the largest percentages of homeless are veterans? In, 2013 alone the VA served more than 249,000 Veterans who were homeless or at risk of becoming homeless (Source: US Department of Veterans Affairs). Another criticism that has been leveled at the filmmakers is that they chose to show only one side of Kyle’s character, leaving out the evil blood lust and racist overtones that come through in his book. I would argue that this holds true for every movie with a flawed hero, from a Gordon Gekko to Abe Lincoln to MLK to JFK. An essential part of great film making is to get an audience to feel empathy with its hero - to a point where we are able to forgive even their worst trespasses because all men have flaws. This may not be the reality, but it is what all brilliant directors and successful films do. I would even argue that Kyle's killing of a young Iraqi boy, barely ten years old, in the opening moments of the film is a big character flaw that creates a likeability deficit, which the rest of the film needs to work hard to overcome, in order to win back the audience’s empathy for its hero. I have never read his book, but I don’t see Kyle as a hero. I see him as another unfortunate victim of an unnecessary war. To this point I would also add that movies, video games and other forms of entertainment cannot ever become our yardstick for reality, values, principles, and history or life lessons. Those still need to be taught in our homes and schools, so that when we consume various forms of entertainment we are able to differentiate between good, bad, fiction and reality and never the other way around. I also disagree that the film fails to show the general disillusionment with the Iraq war, and the lack of clarity of mission. In the movie there is a very powerful scene where Kyle meets his brother, who is returning home from Iraq, as Kyle arrives for another tour. His brother’s utter disenchantment and disillusionment with America’s purpose in Iraq is juxtaposed beautifully as it clashes with Kyle’s blind patriotism and unquestioning, brainwashed, jingoistic sense of duty. Also, I think it is very easy for us to forget how one-sided and “sanitized” the Iraq war reporting was in the American media. It felt more clean and censored than daytime soap operas, so much so that the vast majority of us barely remembered there were men and women dying and being maimed daily. This, as we blissfully continued to drive to the mall and impatiently wait in line at Starbucks, while checking our smartphones for the latest Kardashian gossip. Again this alternate reality is something the movie delves into. We see Bradley Cooper’s character struggle and have a hard time processing this total lack of care and awareness among American people, the same people he had gone to die for. Veteran care or lack thereof is another ignored aspect of war of which American Sniper raises awareness, in a very powerful way. Benjamin Franklin said that "Wars are not paid for in wartime, the bill comes later." It is this real and ongoing human cost of war we continue to underestimate, that American Sniper delves into masterfully. None of us have to deal with the long-term effect it has on children and family members of servicemen. We all saw Obama declare an end to the war in Iraq, but consider that among those who made it back there are now a million Iraq and Afghanistan war veterans with permanent and life redefining disabilities. They include veterans with lost limbs, traumatic brain injuries, post-traumatic stress (PTSD), depression, hearing loss, breathing disorders, diseases, and other long-term health problems (Source: Cost of War, Brown University). In fact, medical experts say that many of Kyle’s unsubstantiated claims, like punching Jesse Ventura and killing looters during Hurricane Katrina, are consistent with patients with severe PTSD. Let’s not forget that Chris Kyle served four tours; he witnessed the horror of war for close to a decade. It is easy to politicise and be critical of everything, as we take for granted the very freedoms that the Chris Kyle’s were told they were fighting to protect. The point is not whether you see Chris Kyle as a hero or villain. This movie is worth seeing because it is ultimately an anti-war movie. One that forces us to recognise the human cost of war, through the eyes of a soldier who has an over-simplistic moral code, which actually makes him the ideal soldier. However, even he cannot escape what Eisenhower and Franklin understood - the ugliness and inhumanity of war; scars all veterans and their families bear forever. If we understand this, then we might understand why everyone who witnesses war first hand says that there are no winners. Even the victors lose. This realization alone will ensure that we begin to hold our leaders more accountable and question any decisions to go to war the next time they try to pull the wool over our eyes and rush in. We must never forget that even though war is sometimes necessary, it should always be the last resort. I haven't seen the film and I don't think I would ever compare a Hollywood film to real life but I can't get over someone living through four rounds of war--a decade is a long time to be "in character" in a war. May we all find peace. War is always a stupidity, wy cannot peopl just live in peace and help each other, be kind to each other and to the nature? This is very informative and rich in content article. You've explained many issues to readers. However, film is always only a film and it cannot express the real situations wholly.